The new System Of A Down studio album, Hypnotize, debuted at #1 on the Billboard Top 200 best-selling albums chart, giving the Los Angeles-based rock band its second #1 debut in a mere six months. 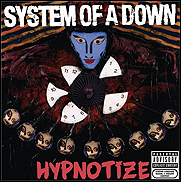 As Hypnotize glides into the top slot of the Top 200, System Of A Down — Serj Tankian (vocals), Daron Malakian (guitar, vocals), Shavo Odadjian (bass) and John Dolmayan (drums) — has become the first band in the history of the chart to score two #1 debuts with new studio albums in a single calendar year. With true first week's sales of 320,185, Hypnotize, the finale to System Of A Down's epic two-part Mezmerize/Hypnotize double album set, is mirroring the success of part one, Mezmerize, which debuted at #1 the week of May 17. Six months after its release, Mezmerize remains firmly planted in the Top 200.